Somewhere in the Starlight Tower, Zoisite is being cheered up by Kunzite, as they both admire the 7 Nijizuishou they finally got. 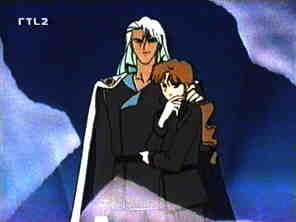 Kunzite tells Zoisite that he knows he has something to make Tuxedo Kamen pay for (which may sound a useless comment, but he thereby endorses what Zoisite is about to do, much against Beryl's orders...). And during all this... 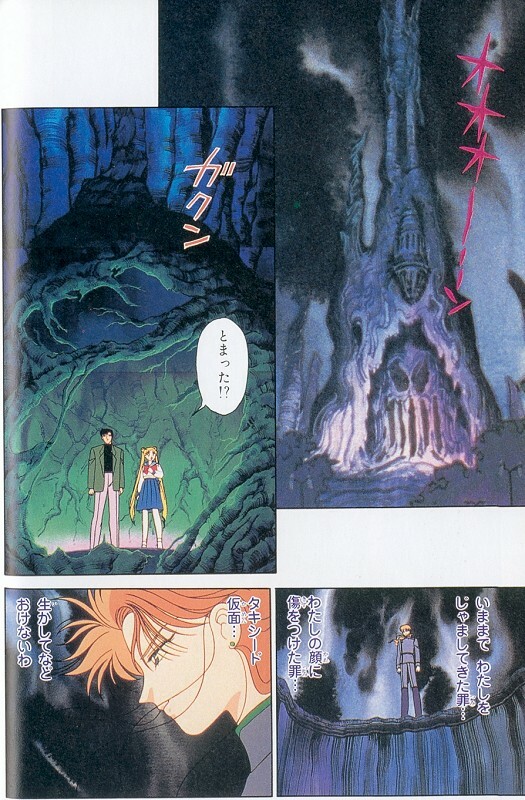 The other Senshi have been informed by Sailor Venus and Artemis (the other cat counsellor) of what was going on, and they reach and enter the Tower. 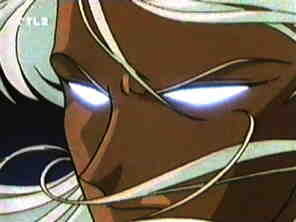 While Zoi is gone to kill off his nemesis, Kunzite senses their presence and uses his power to transform the Starlight Tower into a Dark Kingdom-like tower... That is, quite repulsive if you want my opinion, but never mind. Very impressive display of power. Would grade him Level 5 on my personal scale (which counts 11, 10 being god-like). That is high, people. 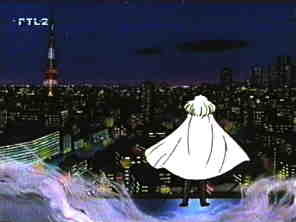 Meanwhile, on top of the elevator shaft, a smiling Zoisite prepares a grandiose ending to his hatred. 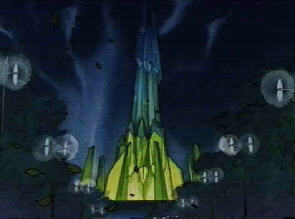 A storm of fire runs down the shaft towards the elevator. 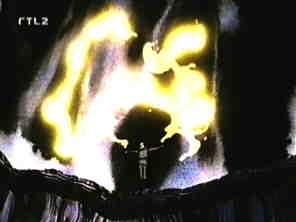 Alas, Usagi transforms into Sailor Moon and it seems (it's not seen how) she manages to stop the fire somehow. 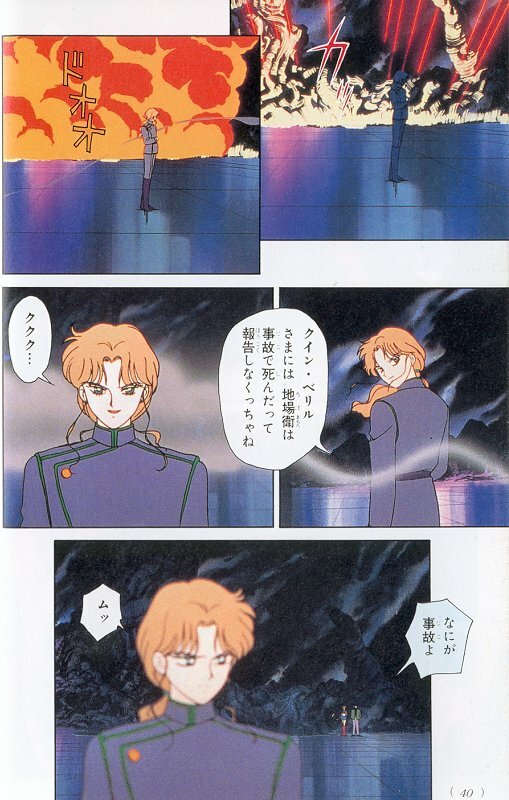 Anyway, as Zoisite turns away satisfied, commenting that Queen Beryl will be tremendously disappointed that Tuxedo Kamen was "accidentally" killed, his hopes are crashed by Sailor Moon's voice. 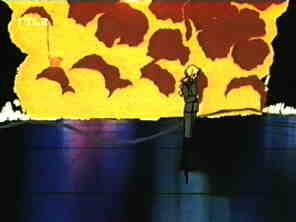 She and Mamoru are near the burning elevator shaft. 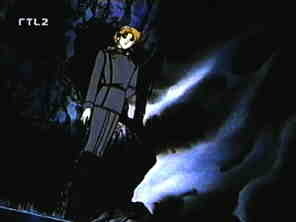 Zoisite turns back to them, unimpressed, and says he'll just have to kill Tuxedo Kamen. 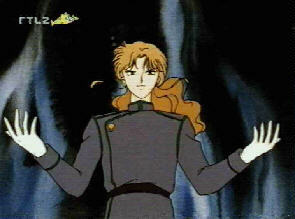 Mamoru "But I *am* here..."
He hands out a red rose with a smile, and transforms into Tuxedo Kamen. 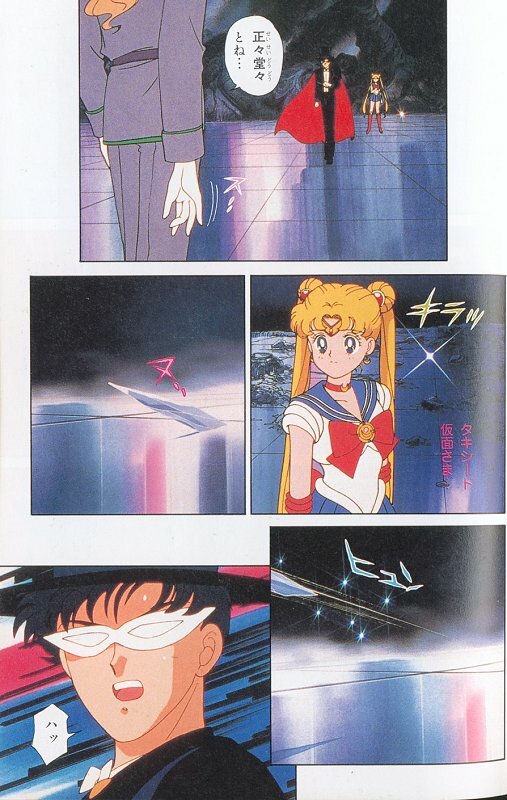 He and Sailor Moon share a sweet moment, she trying to persuade him not to fight since he's injured, he saying it's his fight, not hers. 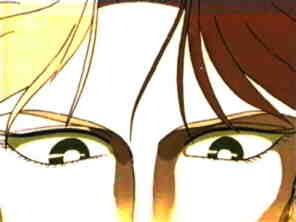 TK is alerted by Zoisite's cruel smile as he launches the ice blade towards Sailor Moon, and he jumps between her and the blade. 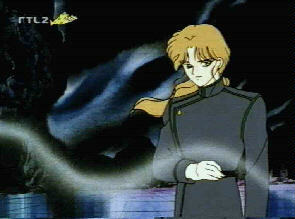 Sailor Moon cries, holding his wounded body in her arms, and sheds tears on him. One tear starts to glow. 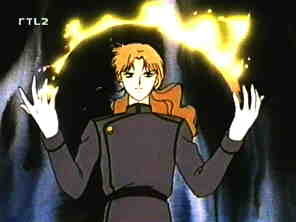 In another room, under the unbelieving look of Kunzite, the seven Nijizuishou starts levitating and fly away from him, joining above Sailor Moon. She's glowing more and more, and the seven crystals gather into one : the Silver Crystal, that sets itself on Sailor Moon's Moon Stick. 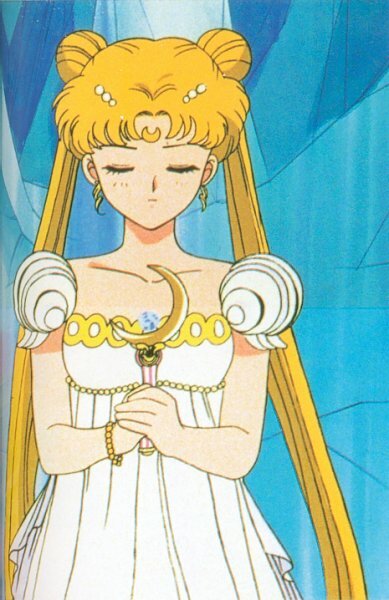 Meanwhile Sailor Moon is transformed once again, showing a moon crescent tattoo on her forehead and a princess gown. The cats recognize her as being the Moon Princess Serenity.